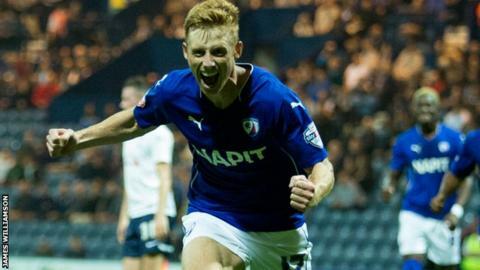 Chesterfield's Eoin Doyle scored a second hat-trick in two games as Paul Cook's side came from 3-0 down to draw with Preston North End at Deepdale. Alan Browne headed the hosts in front, Joe Garner pounced on an error to score and Josh Brownhill nodded in a third. But Doyle, the division's top scorer, scored from Jay O'Shea's pass before finishing a low cross to make it 3-2. And he tucked away a late penalty after Garner handled in the area to complete a remarkable comeback. The spot-kick was Doyle's 11th goal of the season and came just four days after he scored three times in the Spireites' win over Scunthorpe. The draw leaves last season's League Two winners third in League One after seven games, whilst Preston slip to 12th. Match ends, Preston North End 3, Chesterfield 3. Second Half ends, Preston North End 3, Chesterfield 3. Goal! Preston North End 3, Chesterfield 3. Eoin Doyle (Chesterfield) converts the penalty with a right footed shot to the top left corner. Penalty conceded by Joe Garner (Preston North End) with a hand ball in the penalty area. Corner, Chesterfield. Conceded by Tom Clarke. Attempt saved. Joe Garner (Preston North End) header from the centre of the box is saved in the top centre of the goal. Jimmy Ryan (Chesterfield) wins a free kick on the right wing. Substitution, Preston North End. Kyel Reid replaces William Hayhurst. Ian Evatt (Chesterfield) wins a free kick in the defensive half. Attempt missed. Joe Garner (Preston North End) right footed shot from outside the box is just a bit too high. Goal! Preston North End 3, Chesterfield 2. Eoin Doyle (Chesterfield) right footed shot from very close range to the bottom left corner. Assisted by Daniel Johnson. Attempt saved. Josh Brownhill (Preston North End) right footed shot from outside the box is saved in the top left corner. Corner, Chesterfield. Conceded by David Buchanan. Substitution, Chesterfield. Oliver Banks replaces Georg Margreitter because of an injury. Callum Robinson (Preston North End) wins a free kick on the right wing. Substitution, Chesterfield. Armand Gnanduillet replaces Romuald Boco. Substitution, Preston North End. Callum Robinson replaces Paul Gallagher. Foul by David Buchanan (Preston North End). Tendayi Darikwa (Chesterfield) wins a free kick on the right wing. Tendayi Darikwa (Chesterfield) wins a free kick on the left wing. David Buchanan (Preston North End) wins a free kick in the attacking half. Foul by Daniel Johnson (Chesterfield).